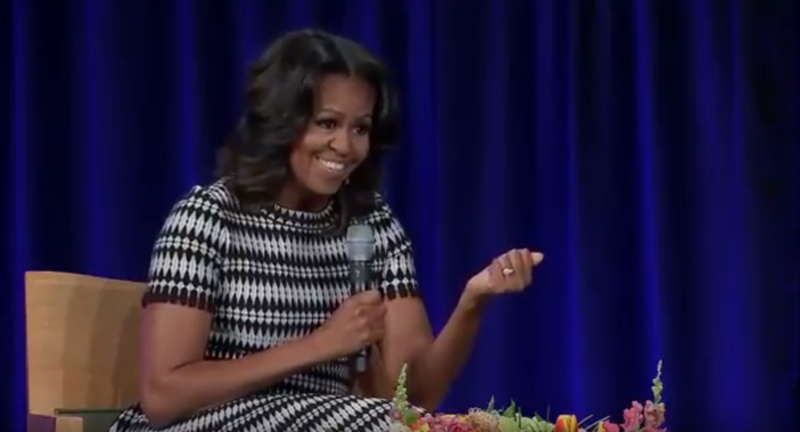 General News, Obama, Opinion, Politics, U.S.
During the Simmons Leadership Conference in Boston, former First Lady Michelle Obama revealed exactly what the Democratic Party thinks the role of the president should be, and it is frightening. She began her comments by saying that the best candidate of the 2016 election was a woman, an obvious nod to Hillary Clinton. This is an odd comment coming from Michelle Obama considering that, in 2008, she had called Hillary unqualified to be elected to the White House. However, it’s not unusual for Democrats to put on a false front in order to demonstrate party unity. She then used her analogy to call President Trump what amounts to a neglectful parent, who lets the kids eat candy all day, lets them stay up late, and allows them to not follow the rules. Many are mocking the ludicrousness of the analogy, pointing out that it was the Obama administration who encouraged an open border policy that left the “household” vulnerable to nefarious characters. It was the Obama administration who was cozying up to the bullies of the neighborhood; Cuba, Venezuela, and Iran. It was the Obama administration that was running guns south of the border and losing track of those guns, only to find out that they were winding up in the hands of the cartels and killing American citizens. It was the Obama administration that was securing FISA warrants to spy on American citizens by providing FISA Courts with DNC-funded political opposition research. It was the Obama administration that was using the IRS to target political enemies. It was also the Obama administration that swapped five high-ranking terrorist leaders for a single American soldier who was already accused of desertion. It was Barack Obama, “the responsible parent,” that dismissed ISIS as a jay-vee team and refused to name the radical ideology that was murdering the American people. President Trump, on the other hand, has been working hard to make sure that the “house” is not bombarded with unwelcome visitors. If they want to come in, they are welcome, but Trump is trying to get them to use the front door rather than sneaking in through an open window or the back door. Trump has passed a tax plan that lets the residents of the household keep more of their money instead of turning it over to the parents to spend. Trump has even gotten ISIS on the run, reclaiming over 90% of ISIS’ territory in less than one year. As far as “the rules” go, President Trump is having a difficult time enforcing immigration laws in the country because the last administration ignored them for so long. All around, it could easily be said that Trump has been focusing on making the household “great” again, while Obama was focused more on a social justice platform. More importantly, however, is the actual analogy that Michelle Obama uses. This speaks volumes about the ‘government-knows-better’ attitude that has been permeating throughout the Left in the country. Michelle Obama may not have realized the implications that came along with her criticism of President Trump, but she may have just let the cat out of the bag about how the Democratic Party actually views the relationship between the American people and the federal government.